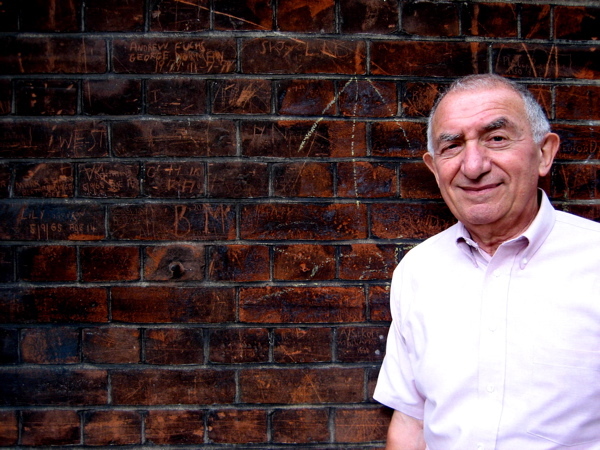 Today Aubrey Silkoff returned to Navarre St, Arnold Circus, to see the brick where he incised his name on the nineteenth of April 1950, when he was eleven years old – you can see it just to the left of his upper arm in the photo above. When I first spoke with Aubrey over the phone, he admitted that he had no memory of carving it, although he confirmed that he grew up here in Laleham Buildings on the Boundary Estate and Navarre St was where he played football as a child. 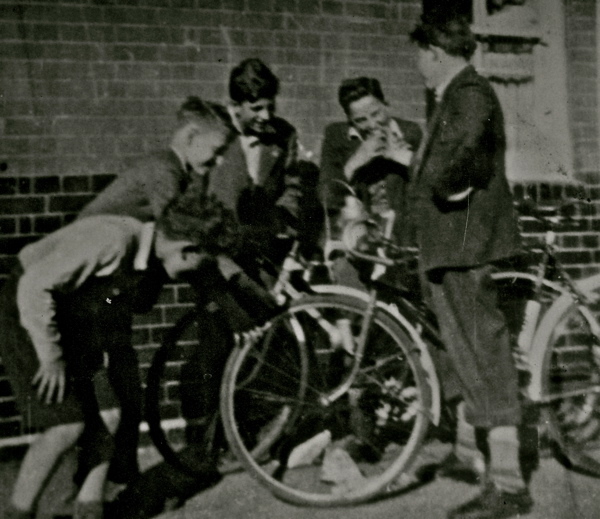 Fortunately for us, 1950 was also the year of the photo craze when Aubrey and his pals acquired cameras and were able develop their pictures at the Boys Club at Virginia Rd School. As a consequence, we have a photographic record to show us some of the children who wrote their names on the wall of Wargrave Buildings at that time. Capturing the spirit and energy of a fleeting moment, these pictures allow us to put faces to the names incised on the bricks, vividly evoking the childhood world of over half a century ago which produced graffiti of such unlikely longevity. 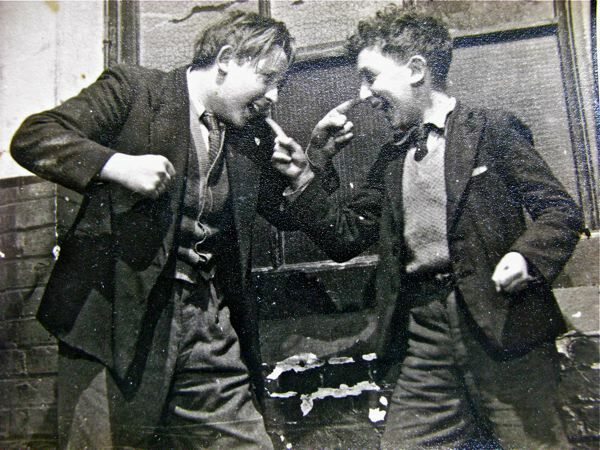 Recalling Bert Hardy’s photographs of East End children on the street, what makes these exuberant images special is that they were taken by the children themselves. As we walked down Navarre St together, I had the strange experience of introducing Aubrey to his long forgotten graffiti. “It was something to do while we talked,” said Aubrey, explaining that he and his pals used nails from the wooden scooters they constructed to roam as far as the bombsites in the City and around St Pauls. Yet although Aubrey recognised a few names when he saw them on the wall and even matched some up to the pictures, together we confronted the limit of his fragmentary memory after so many years.“I wonder what life held for them?” he said quietly, contemplating the names on the wall, as we stood in the empty street lined with parked cars, that once echoed to the noise and shouting of children playing. “The streets were clear of vehicles, except maybe the odd coal wagon or a fruiterer with a horse and cart. There were few cars because no-one could afford one and, if someone bought one, they took all the kids for a ride in it as a novelty.” Aubrey told me, explaining how, as children, they had possession of the streets for their playground, using cans, or laying down jumpers or coats in the road, to create goalposts. “We were a group of kids that used to know each other and spend all our time together in the streets because the flats were not conducive to living in. 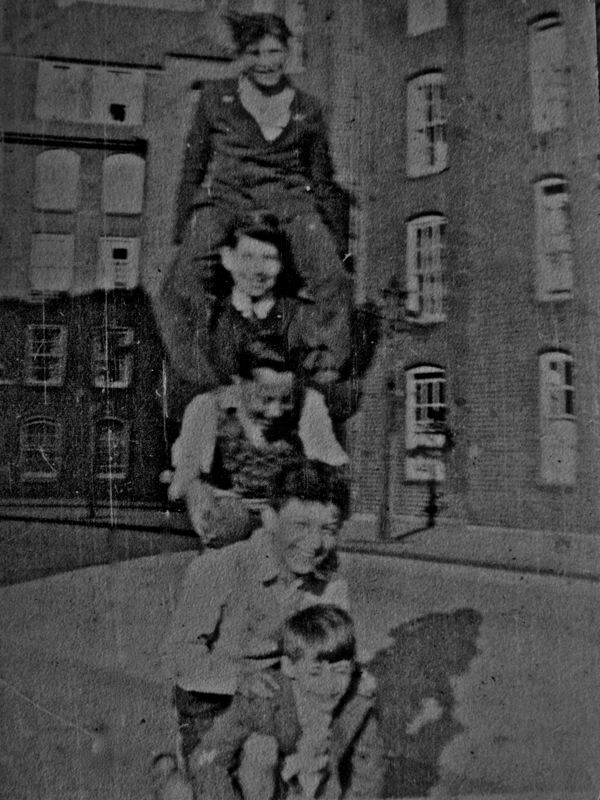 There was no space for us inside, so we used to be outside, swinging on the railings at the corner of Navarre St and Arnold Circus. We didn’t know anything about girls. The boys had nothing to do with girls. Half the kids were Jewish but there was no conscious decision to mix with your own kind, although I think we gravitated together because we considered ourselves outsiders. Many kids had lost their fathers in the war, and they had background problems. You didn’t know that you don’t have much money, because it was just not to be found. I had new clothes once a year. I used to have a new suit at Passover. My mother took me down to a place off Brick Lane. There were schleppers everywhere on the street – touts for tailors. I remember going back for fittings, there wasn’t much ready-made clothing available then. I was ashamed of my parents because I was born late and I thought they were old. On the day of the V.E celebrations we came down into the yard with our food on plates and our chipped enamel cups, we didn’t have china. And when the people saw them, they asked in disapproval, ‘Can we replace them?’ That was embarrassing. I took the eleven plus exam which decided whether I would go to Grammar School or Secondary Modern which was inferior. I don’t know what happened but I never passed or failed, I went to a Central School instead. At the end of term we were called onto the stage and divided up between which schools we were going to. I cried because I didn’t go to Grammar School. It was cruel because it split friendships up. ‘What are you doing today? We’re doing Latin and logarithmic equations,’ they said, and I felt a failure because I didn’t do any of those things. Nothing has been easy for me, exams were always hard. But I was never at the bottom and never excelled either, I was always in the heap. I was fortunate that in those post-war years there were expanding opportunities open to me, giving me an education and a career – because I had no ambition, I never looked further than my nose. Though I knew I wanted to get out of the East End because I did not want to work in a tailoring sweatshop as my father and all his friends did. As a greeting they, always asked each other, “Are you working?” because the work was seasonal, and people were out of work for long periods of time. 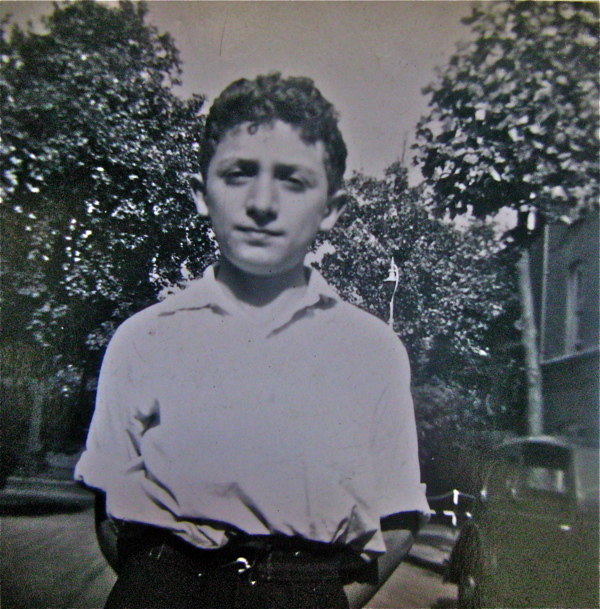 In 1958 I moved out to a bedsitter in Stoke Newington on my own. I learnt to look out for myself and be wary of what people are trying to put over you, and as a consequence I’ve been known as a cynical person throughout my life. But I have no regrets about any of it today because it gave me a sense of looking at the glass as half empty. I never expected anything wonderful to happen and it has. I have progressed over the years and I feel very lucky indeed. 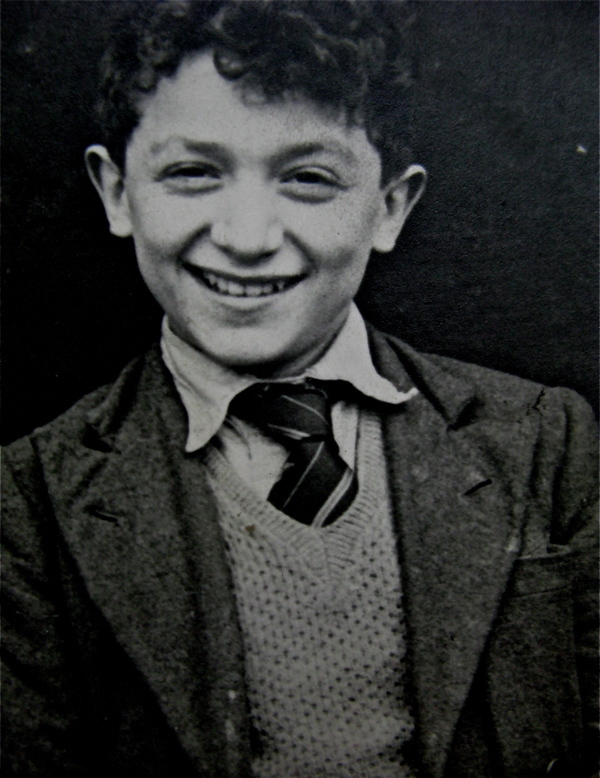 Contemplating the photo of himself at eleven, a crucial moment in his childhood, Aubrey pointed out the spilt food on the “scruffy” jacket and interpreted his expression as “sardonic,” while I saw self-possession and humour in his youthful visage. “I’m thinking ‘Why am I here?’” he said, rolling his eyes with a droll grin.“Now I look at all these photographs and I wonder,’Did it actually happen?’” continued Aubrey, thinking out loud. Today, when he returned to Arnold Circus, he encountered the evidence that it did happen, because sixty years later, Aubrey found his name graven into the wall on Navarre St. Aubrey Silkoff, Wed 19th April 1950. 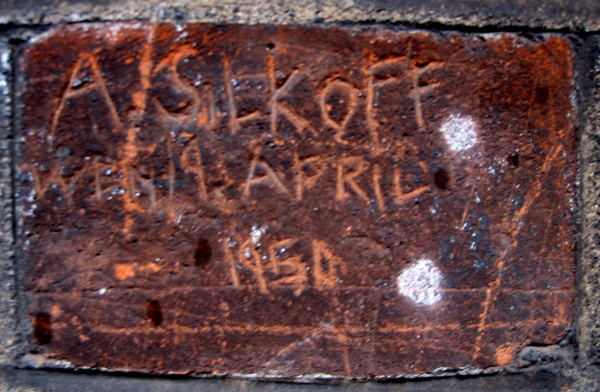 Aubrey Silkoff at the time he wrote his name on the wall of Wargrave Buildings. A stunt at the corner of Navarre St. 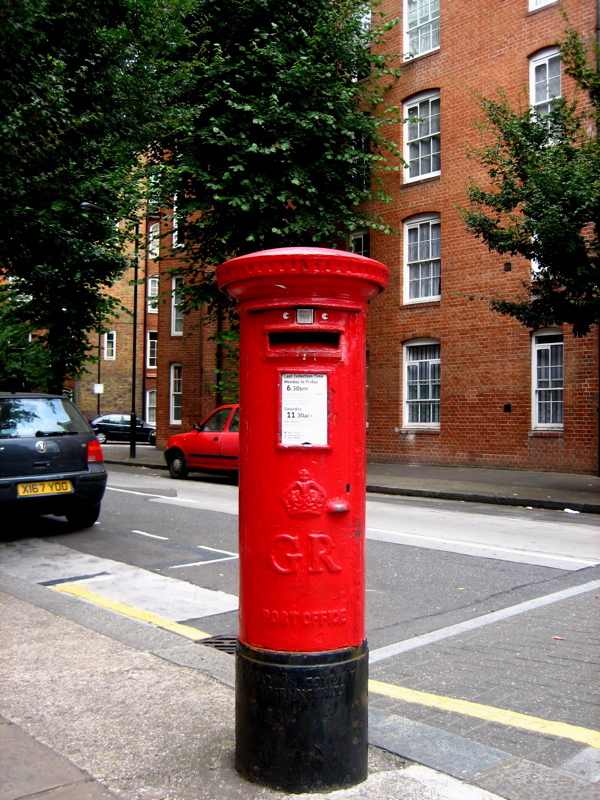 The trick revealed – this is the same pillarbox that Aubrey and his pals used in their photograph. Aubrey Silkoff – with his brick in the top left corner. That’s wonderful. And he hasn’t changed a bit. Thankyou Paul, for being the one who first introduced me to the Navarre St graffiti. I googled you and found the article impressive. Although I was aware of your youth as a result of our longstanding friendship. I enjoyed our afternoon together 26/9/10 very much. We will meet again next time I am visiting the United Kingdom. 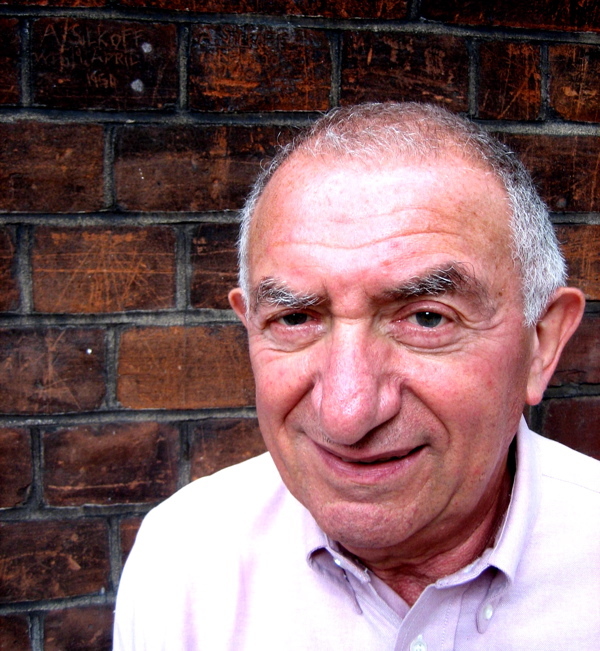 i met this quiet yet proud man last evening in christchurch spitalfields ..we shared an ale ..i got him an eccles cake for later and he spoke a little of his life .. and advised us of the hebrew inscription in the vestibule of the church . hi Aubrey i remember Jean we used to meet up at work at Central Middlesex in the 1980s! hi aubrey nice ot se a familar face on these pages-I am soewhre here too ! Carol. I have often wondered what happened to everyone. I wonder how of the readers of these wonderful memories of Elder Street will remember Raphael Samuel? He was my wife’s first cousin and she has rich and fond memories of him. 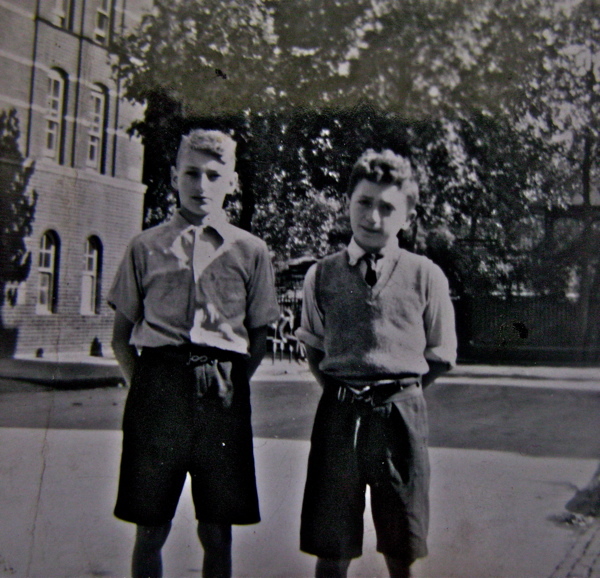 I started collecting Hackney in 1962 when I was in the 4th form of Hackney Downs (Grocers’) School. I met Roma in 1964 when I went up to Sheffield University. And soon after I started learning of her large family which included Raph. He came to our wedding in 1968 and gave us a book for a wedding present. It remains (well read) on our book shelves. Mary Booth the secretary of Stanley Crowe (probably THE best topographical and second-hand bookseller of London remembers Raphael Samuel as brilliant but rather semi-detached at times!! Surfing through the internet I was pleasantly surprised to see your name. 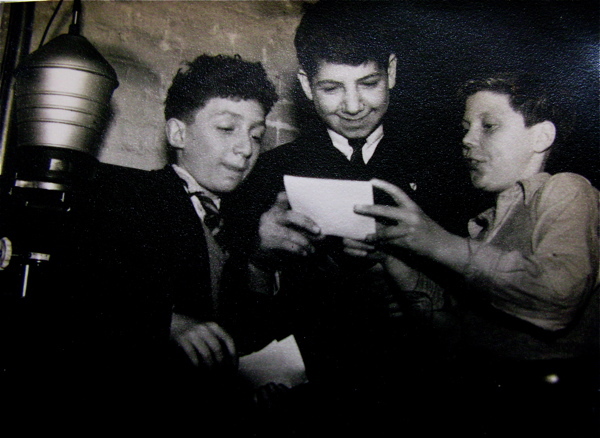 I was even more surprised to see a photograph of me with you and Alan Kanovitch. I believe it was taken by Mr. Titchenor during his photographic club. It was very interesting to read your memories of our life in the late forties and early fifties, seems a world away now.